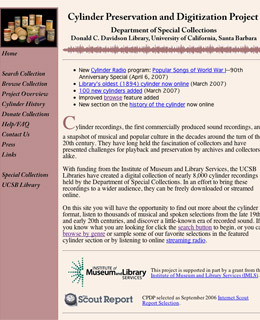 Drop by the University of California, Santa Barbara's Cylinder Preservation and Digitization Project to add some truly cool alternative oldies to your music collection  the site has a compilation of about 8,000 songs from the early 1900s. The archived tunes are the oldest to have been digitally preserved; the originals were the first commercial recordings made in the U.S.  etched onto wax-and-metal cylinders, vinyl's precursor. (The site has an extensive history of cylinders as well.) As you listen to the hymns and spirituals, cakewalks and string quartets, you'll feel as if you've waltzed back in time. Are you more into the spoken word? You can also tune into comedy and vaudeville performances, which were among the most popular and amusing recordings of the time. All the audio is free to stream in your browser or download as MP3s, courtesy of the Institute of Museum and Library Sciences.